Views give you different ways to look at items in a folder. 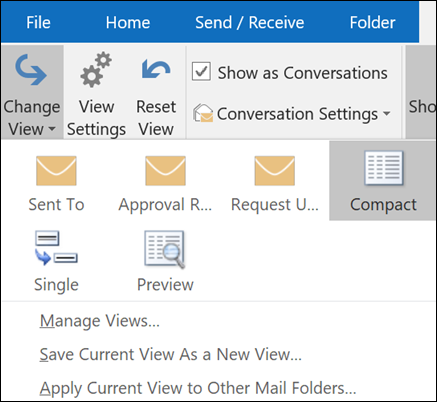 Each Outlook folder, such as Inbox and Calendar, allows you to customize your view to change the organization of items, fonts, and many other settings. The most common change to make to a view is to change the font size in the message list, the Reading Pane, or when composing a message. Select View > View Settings. Select Other Settings in the Advanced View Settings box. Select Column Font or Row Font. Note: To change the font size of the message preview, sender name, and subject in the default Inbox view, choose Row Font. Select the font, font style, and size you want, then click OK three times to save your settings and apply your changes. Note: If you only want to change the font or font size for the message preview (the line of message text you see under the subject and sender, select Font under Message Preview. The Reading Pane doesn't allow you to change the default font or font size. However, you can zoom in or zoom out easily. 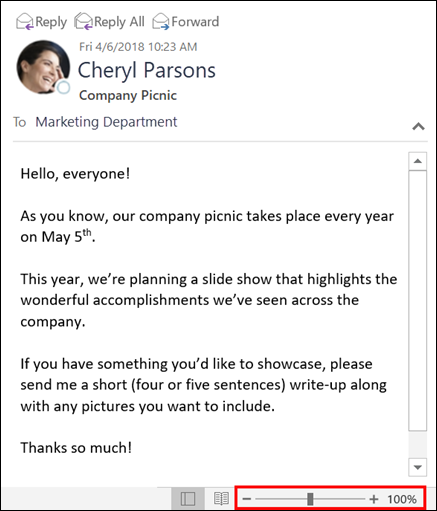 You can also tell Outlook to display all of your email messages in plain text, and have more control over the font size. If you're an Office 365 subscriber, you can select a zoom percentage that persists across all of the messages you read. At the bottom right corner of the Reading Pane, click the percentage (usually 100%) to display the Zoom While Reading dialog box. 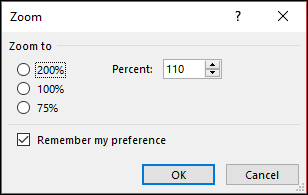 Choose one of the default percentages or enter your own percentage. Select the Remember my preference checkbox to keep your zoom level the same across all messages you receive. If you're not an Office 365 subscriber, the Zoom percentage will not save from one message to the next. Every time you switch messages in the reading pane, you'll need to zoom in or out. To change your zoom percentage, use the following steps. To zoom in or out in the Reading Pane, look for the magnification slider at the bottom right corner of the Reading Pane. Move the slider left or right to change the size of the text in the Reading Pane. Note: Any change you make to the zoom level only persists while you're viewing the message. If you select a different message, the zoom percentage will return to 100%. If you click back to the first message, the zoom percentage isn't saved. To change the font size for messages when composing, replying, and forwarding, use the following steps. Select File > Options > Mail > Stationery and Fonts. 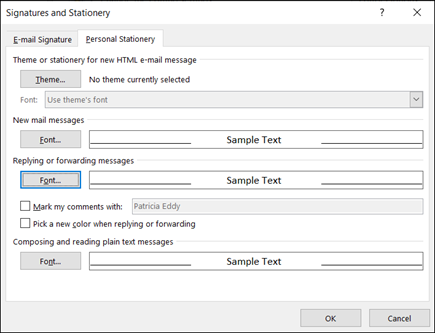 Select the Font button for New mail messages or Replying or forwarding messages to change the default font, font size, and font color when composing or replying to messages. Click OK twice to save your changes. For additional tasks, choose from the options below. Sometimes, it's easier to start with a brand new view rather than modifying an existing view. 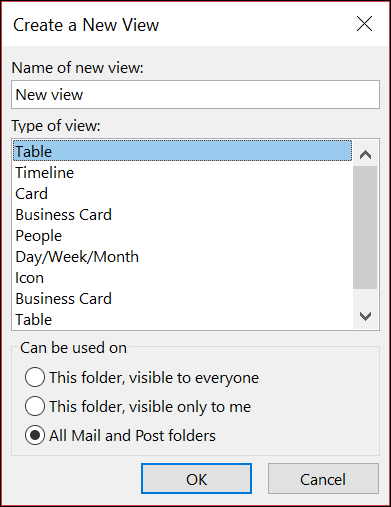 You can create a new view in any Outlook folder. Click View > Current View> Change View > Manage Views > New. Note: If you want to start from an existing view, in the Manage All Views dialog box, select <Current view settings> and then select Copy. Enter a name for your new view, and then choose the type of view. Under Can be used on, accept the default setting of All Mail and Post folders or choose another option, and then choose OK. In the Advanced View Settings: New View dialog box, choose the options that you want to use, and then choose OK.
To use the view immediately, choose Apply View. There are several different types of views you can choose when creating new view. Table A table view shows your information in rows and columns. This is one of the most effective views for email messages. Timeline A timeline view shows your items along a fixed timeline. It's useful for tasks or for folders that contain a small number of items spread out over a period of time, for example, a collection of twenty emails for a specific project. Card Card views are typically used for contact folders. In a card view, you'll see a variety of fields that apply to each item, whether they're filled in or not. Business Card Business card views are typically used for contact folders. In a business card view, you only see fields that contain data. People A people view is a view of your contacts that doesn't show the same level of detail you see from Card or Business card views. You'll see a list of your contacts with their name and photo. Day/Week/Month A Day/Week/Month view is typically used for Calendar folders, but you can use it for email folders as well. Icon An icon view shows your items with an icon and their subject. This view is useful for folders with few items or for notes folders. Important: You can't delete a predefined view, even if you changed its settings. On the View tab, in the Current View group, choose Change View > Manage Views. Under Views for folder, select the custom view that you want to remove. Choose Delete, confirm deletion, and then choose OK.
What you like to do? Switch to the view that you want to base the new view on. On the View menu, point to Arrange By, and then click Custom. For each type of change that you want to make, click a button, and then select the options that you want. For example, if you want to add or remove columns, click Fields (columns are also known as fields). Then add or remove fields, or create a custom field. When you finish making changes, close the Customize View: view name dialog box. On the View menu, point to Current View, and then click Define Views. In the Views for folder folder name box, click Current view settings. In the Name of new view box, enter a name. To change where the new view will be available, click an option under Can be used on. Note: All programs on your computer that use date settings from your operating system will be affected by the changes that you make in Control Panel. If you are using multi-line layout and have added several fields to your view, you may need to increase the number of lines displayed in multi-line layout to see all the information. On the View menu, point to Current View, and click Customize Current View. Under Other Options, change the value entered for x in Use compact layout in widths smaller than x characters. 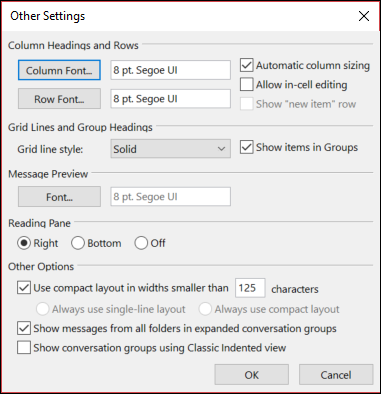 For example, a setting of 80 characters indicates that whenever the list of message headers is reduced to a width of fewer than 80 characters, Outlook automatically displays a two-line preview. New views are added to the Current View submenu. In Contacts, Tasks, and Notes, you can quickly change the current view by using the Customize Current View option in the Navigation Pane. In the Name of new view box, type a name. In the Type of view box, select the view type that you want. To change where the view will be available, select an option under Can be used on. In the Customize View: view name dialog box, select the options that you want to use. When you finish selecting options, click OK.
To use the view immediately, click Apply View. Note: All Office 2007 programs on your computer that use date settings from your operating system will be affected by the changes that you make in Control Panel. In the Views for folder folder name box, click the view that you want to rename. In the New name of view box, type a new name. Note: You can't rename a predefined view, even if you have customized the view. Instead, copy the predefined view, give the copy a new name, and then change the settings. In the Views for folder folder name box, click the view that you want to be available in other locations. To change where the view will be available, click an option under Can be used on. Note: New views are added to the Current View submenu. Switch to the view that you want to change. On the View menu, point to Current View, and then click the view that you want. Select the options that you want, and then click OK. In the Views for folder folder name box, click the view that you want to change back to its original settings. Note: If the Reset button is unavailable, you may have selected a custom view or a standard view that has not been customized. In the Views for folder folder name box, click the view that you want to delete. Note: You can't delete a predefined view, even if you have changed the settings for the view.